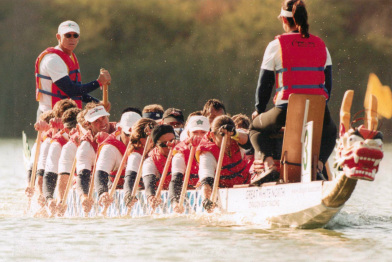 Dragon boating arr ived in California in 1983 when Singapore presented the City of San Diego with three boats. A competition among thirteen local teamswas held to select a team to compete in Singapore in the following year. The Hanohano outrigger club under the coaching of Rena and Egon Horcajo was victorious and was selected to compete in the 1984 World Invitational Dragon Boat races in Singapore. This team won that competition becoming the first non-Asian team to capture this coveted title. Since its inception the San Diego Club has developed in many ways amassing an impressive history of successes at all levels including national and world championships. We also have grown along the way by adding other teams including our first women’s team in 1992. This team won silver medals in Singapore and Hong Kong in their first major international competitions. 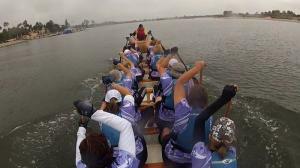 More recently the club has added very active women’s cancer survivors (Team Survivor) and University of California San Diego (UCSD Surf Dragons) teams. A youth program also is under development. In addition to U.S.A. based competitions, our members travel extensively to compete against the best teams in the world. Foreign competitions have involved many trips to Asia including over a dozen stops in mainland China, Taiwan, Hong Kong, Japan and Macau. Trips to Europe have included competitions in Italy, Germany, Poland, Hungary, and the Czech Republic. Other competitions have taken us to South Africa, Canada, and Australia. We encourage our members to keep their passports up-to-date! The San Diego teams have a long history of success at all levels of competition.